Boston For A Day, anyone? 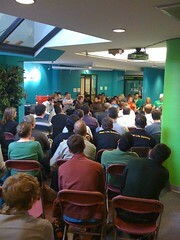 Earlier this week, we hosted Techstars For A Day in Boulder. About 100 applicants were able to attend, and we had a great lineup. It was fantastic meeting everyone and learning more about what they were up to as well. On Tuesday, we have a similar event coming up in Boston. We’ll be unveiling our new Cambridge offices for the first time. So far, nearly 60 applicants have confirmed attendance. In order to potentially receive an invitation, you must turn your application in no later than Saturday, March 7th. If you haven’t received an invitation yet and were hoping to, please read this. Here are some more photos from the Boulder event this past week.